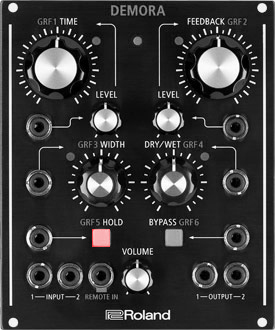 Roland have expanded their Aira line to now include a set of 4 mini semi modular effects. They fit right into a eurorack case, power either from the 9v wall wart, or the supplied eurorack ribbon cable, and they connect to a computer or an iPad using the usb/audio racks (respectively) for further and much deeper editing. One of the coolest thing about the Demora is the magnificent little HOLD button. When I am rolling along in a live set, and I can actually capture the delayed sound and press hold, cutting an instant partial loop and then start messing with it either against the sound source, or in place of it. Creating dramatic breaks, fills, and really fun freak outs is totally what this seems to have been made for. This tiny sucker is a delicate little flower when it comes to the settings. And so while it’s quite easy to set up a delay and enjoy it, locking the tempo into a rhythm sufficient to convince a huge dance floor full of people that you’ve just magically locked 1/4 of a bar of your 303 and are now wildly altering the pitch and time of it (driving them barking mad with hacienda style joy) is troublesome. I delved into the software and reached out to Roland and we discussed the sort of planned methods of syncing the tempo of the Demora to a sequencer. In fact, if that’s what you’re looking for Roland Australia have written a wonderful post about each of the modules in the software and it’s very handy. But the sync solutions for midi each appear to involve a computer. There is however a tap tempo solution among the presets provided in the software editor. This preset makes use of the Trig to Delay Time CV module, and allows the musician to tap in the tempo. This is cute, and it makes a great tweak sound when tapping, but… the button the preset chooses to replace is my beloved HOLD button. I could perhaps swap it around and use the BYPASS button instead, but that’s a very handy performance tool as well and I’m not willing to surrender it. First of all I am assuming you have a method of sequencing CV/Gate. It’s possible that if you’re working with a computer this could all be a lot easier, but I don’t write, perform, or produce with a computer any more and so this isn’t a solution for you if you’re connecting your Demora up to Ableton. In that case I suggest you just use the MIDI clocking preset supplied in the software and carry on. But if you’re an analog head, and a live improvisationalist like me, then you need something which will at least assist you in stabilizing the tempo for greater control of loops, time, and effects. 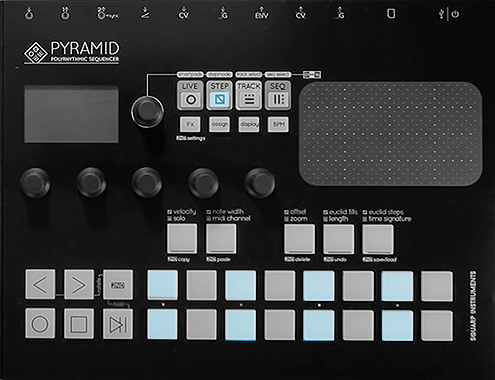 I am using the Squarp Instruments Pyramid Sequencer for this example and will describe exactly how to accomplish a CV synchronized delay time with the Demora delay. FIRST Connect a patch cable into GRF1 on the Demora. FOURTH Press play on the sequencer, and apply a little of the Demora’s delay onto something. Setting the GRF1 knob to 12 o’clock gives a nice and tight 1/4 note delay. Rotating the knob all the way around to the end gives a very tight whole note delay. And between at about 2 o’clock you get a brilliant 1/8 note delay. Notice that using the HOLD button is uninterrupted, and the timing is self adjusting. Each pulse of the CV sequence brings the loop back into time. It’s wonderfully tight, but still leaves the musician free to spin the knobs and make a huge mess which is easily and swiftly cleaned up. I hope this was helpful. I looked and looked and looked for anyone else out there documenting these troubles, and couldn’t find a soul. So either I’m alone, I’m a complete idiot, or no one wants to talk about it. So I’m laying it on you for your pleasure. You’re not alone :) thanks for this, interesting read! i have done it a bit different and connected the trig to delay time cv whilst having the cv pulse on the bypass (disconnected with bypass) i connected the GRF 1 to delay time cv. but its weird, it syncs well, but the divider dies not always work. any advice how to check faulty connection?